Just recently a friend of mine forwarded me a copy of a Reflection she had written encompassing the Sunday Scripture readings for that week and within this very perceptive article she had included a charming little story about her grandmother. She had remembered as a small child, her grandmother always leaving behind a small container of salt in the cupboard of any holiday cottage they were leaving so the next occupants would not have to go without this very important part of our diet. Many of the offerings ordained by God were sprinkled with salt as a sign of the importance of always remembering the incredible privilege God was extending to his people in promising to dwell among them. 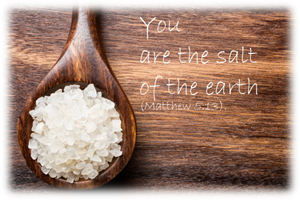 So when Jesus tells his disciples and us that we are the salt of the earth we become part of that sacred offering. 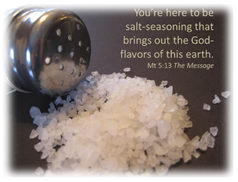 We become sprinkled with salt that is given to us for a very special reason and Paul shows us how we can sprinkle others with what we have been blessed with. Leaving behind a little salt! 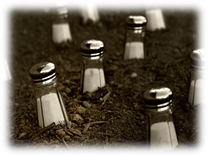 When Paul was writing to the Galatians, he reminded them of the beautiful gifts of the Holy Spirit and I saw this as again a lovely example of how we could take Jesus word’s seriously about being the salt of the earth and try to leave some of this saltiness, mentioned here, behind wherever we find ourselves this week. And I just thought it was something to make food taste better! Thanks Jo. It was a beautiful story to begin with!! Dear Jo – you are a marvel, making such a beautiful story of such a simple one. Thank you.